Wondering what to give to that favorite Aunt & Uncle miles away? Consider shipping a bottle or two of wine. 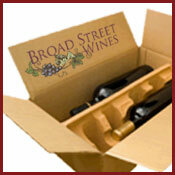 We can help you select wines at all price points and ship them. If you want to give wine but aren’t sure what to buy, consider a gift certificate, available at any amount you choose. 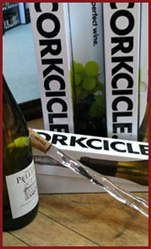 What looks like an arctic front freezing its way through the center of your bottle is actually the innovative Corkcicle. This icicle is made of BPA-free plastic filled with a reusable freeze gel, so you don’t have to worry about an early thaw diluting your wine. Simply place your Corkcicle in the freezer for at least two hours, and then insert it into any bottle of wine (after 1 glass has been poured) to maintain chilled white wine or to bring up red wines to their perfect temperature. These unique handcrafted wine lites from wine bottles make great additions to anyone’s patio or deck. They come in several different sizes, shapes and colors and are easy to use. Add your favorite candle and brighten your Holidays. Made by a local artisan. Everyone who has one loves it! You can stop in and try wines that you haven’t tasted and just enjoy the glass or maybe buy a bottle of the wine. Several customers have discovered new favorites by sampling from the Wine Station. They are always a hit. Necessity is indeed the mother of invention. Govino was originally created as a trade tool to help professional salespeople showcase their wines whenever and wherever proper stemware isn’t accessible – which as we learned firsthand, is often! Once we began testing the market, we realized there was an even bigger need for Govino in the consumer sector, particularly at settings where breakable glass is an issue. After all, how many times have we all had to endure drinking good wine from bad glasses? Rated 98 points by Beer Rate, this is sure to please the Belgian Ale lover on your list. Its aroma of chocolate malt and spices is reminiscent of the wonderful smells of holiday baking in Mom’s kitchen. On the palate this silky smooth ale is predominantly malty, with smoky, spicy and citrusy notes, and a long, lingering finish that is lightly tart and malty. The ultimate stemware for casual entertaining and everyday sipping, these beautiful, extremely durable glasses will maintain their sparkling clarity through years of daily use. Schott Zwiesel, a German company known for glassware innovation since 1872, creates the break-, chip- and scratch-resistant stemware using patented Tritan titanium technology. Each glass features a varietal-specific bowl designed to showcase the bouquet and flavor of wines. Graceful stems are proportioned for optimal stability. Made in Germany, this lead-free crystal glassware is favored by premier restaurants and hotels around the globe. Dishwasher safe. To help you ring in the New Year – We have 20 sparkling wines to choose from, AND, if we don’t have your favorite, we will try to order it for you! We have several styles and woods from which to choose. Made by a local artisan. You may have seen the chart that we have displayed, and we have them available for purchase.